A bit over an hour to the east of Portland, OR is the town of Hood River. There's a lot to do once you get there, but getting there is a lot of fun, too. If you take Interstate 84 there, like we did, you'll go through The Columbia River Gorge National Scenic Area rewarding you with fantastic views of the river, rock formations, and just the overall beauty that is "The Gorge." Cool stops along the way can include Multnomah Falls, Bonneville Dam, and numerous parks and trails. We stopped at Cathedral Ridge Winery on our way into the city. They have beautiful grounds on the outskirts of Hood River, as well as some pretty good vino. There are a number of wineries around Hood River. If you go, make sure to get a wine map of the area so you can visit the various other establishments. Once in Hood River, there's a ton to do. Hood River is the windsurfing capital of Oregon (if not the world), due to the frequently windy conditions along The Gorge. There's also tons of hiking and mountain biking trails nestled throughout the hills. It's sort of a Mecca for outdoor enthusiasts. We chose to partake in another thing Hood River is well known for: Beer. There are three breweries in the city: The well-known Full Sail Brewing, Horse Feathers Brew Pub, and Double Mountain Brewery. Not bad for a city with a population of 21,536 people. 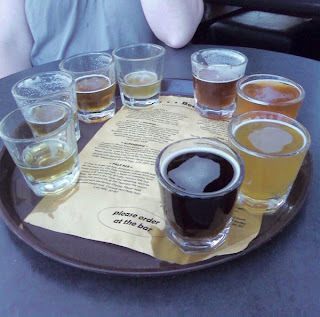 We stopped at Double Mountain for lunch and the beer sampler (at left). Great beer; the Pilsner, the IRA (India Red Ale) and "Hop Lava" were standouts. We grubbed on the meatball sandwich, too. You can take beer home with you in their 64oz growlers, as well. After lunch at Double Mountain, we walked down to Full Sail to pick up their new Session Black dark lager. I haven't cracked one open yet, but at $10 for 12 beers, I probably can't go wrong ( regular Session Lager is good stuff at a good price, too). Another thing Hood River is known for is a lot of cool shops. Whether you're looking for clothing, jewelry, outdoor equipment, or just about anything else, Hood River probably has it on Oak St., which is the main drag. 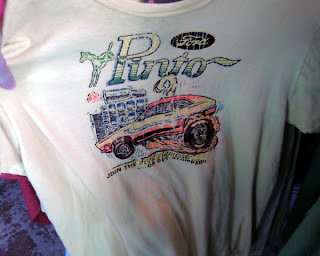 We went into a vintage clothing store called "That's Swank," and found a pretty awesome old Ford Pinto t-shirt. The text read "Join the Ford Stampede ... or get stomped!" Apparently it was an original 1970s shirt, too. After enjoying Hood River, it was time to mosey back towards Portland. We hopped on I-84 west and decided to take the Historic Colombia River Highway back. 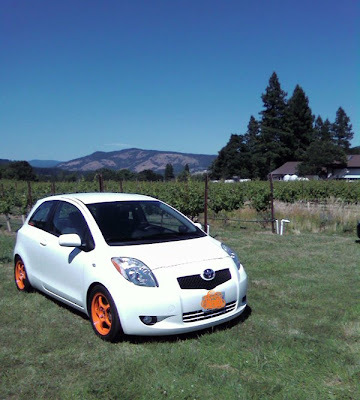 We hopped on at exit 35, and took it all the way into Troutdale, OR, or about 33 miles. This narrow two-lane highway is twisty, curvy, and passes several historic monuments, scenic viewpoints, and numerous waterfalls including the famous Multnomah Falls. We stopped at Latourell Falls, which was gorgeous. The other place we stopped was the Vista House. This was a rest area built on the Historic Highway during the 1920s. 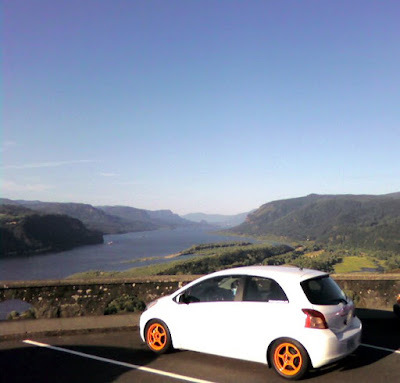 It's one of the best views of The Gorge from just about any road. We had a fantastic time on our day trip to Hood River. Next time I'll remember to bring my real camera so I'm not stuck taking pictures using my camera phone. The picture below is looking out over The Gorge from the Vista House. What a great road trip Andy. I love making that drive, need to do it again. Next time you decide to head out to Hood River, check into the train trip up to Parkdale, wife and I did it a few years ago. So, how is the Sessions black, I like the regular Sessions. By the way, if you havn't figured out who I am yet, its robbiej, lol. Cool--thanks, robbiej. And yes, I wasn't sure who you were. I knew you were part of the Scion clan, though! I haven't tried the Session Black yet. I'll let you know when I do, though; probably tonight. Then again, it's 5:00 somewhere, right? The scenery over there is quite nice and your Yaris looks very cool as usual.